In Part 2, I showed that the idea of a man covered with leaves, as well as the name for that man, “Green Man,” existed for a long time, in the same cultural milieux as the carved foliate faces on churches. However, it is not clear that these two artistic traditions were related. Although scholars like Lady Raglan in the early twentieth century, and Terri Winding in the early twenty-first, identify the Green Man with a variety of practices going back to pre-Christian times, in fact we can only trace the name “Green Man,” as applied to such a figure, back to the sixteenth century. The foliate faces were, for the most part, older than this; according to Jacqueline Simpson and Steve Roud's Oxford Dicitonary of English Folklore, they exist as decorations on manuscripts as early as the tenth century, and as carvings in English churches as early as the twelfth. While it is impossible to say whether people commonly connected the two prior to the twentieth century, we can certainly say that people sometimes connected the two, long before Raglan did so. In his article “The Name of the Green Man,” published in the journal Folklore, Brandon S. Centerwall showed three examples of this connection. I will recap them briefly, and add two more examples. Probably the weakest of Centerwall’s examples comes from the spandrel of a choir stall in Winchester Cathedral, Hampshire. According to Centerwall, it was carved by William Lyngwode in 1308. It shows a figure with a sword in one hand and small shield in the other, whose head is a classic foliate face disgorging leaves. 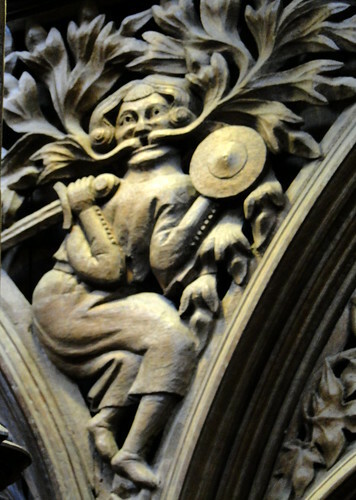 Centerwall argues that in this carving, the ‘Green Man’ of church architecture and what he calls the “combatant Green Man” (i.e. the club-bearing, leaf-wearing wild man of the pageants) are a single figure. He goes on to note the principal weakness of this example, however: “Unlike the later representations, this one is dressed in conventional clothing and carries a sword and buckler.” In other words, it is more a man-at-arms than anything resembling the Green Man of the sixteenth century. Fortunately, his two other examples are stronger. One comes from Germany, which had a tradition similar to the English Green Man, and which in some regions called that figure Der Grune Mann, “The Green Man.” It is a mid-fifteenth century engraving by the Master of the Nuremburg Passion, showing a leaf-clad wild man defending his woman and child from a lion, using a club and a shield. The shield is fashioned in the shape of a foliate head. Here, then, we have both types of Green Man closely juxtaposed. Centerwall’s third example is a bench-end from the Church of the Holy Ghost in Crowcombe, Somerset, which was carved in 1534. It shows two wild man figures, brandishing clubs, emerging from what look like seed-pods, which in turn emerge from the ears of a foliate head. The leaves encircling the wild men’s waists are clearly the same type of leaves that cover the top of the foliate head from which they spring. It is interesting to compare these figures with the first description of the Green Men of the London Mayor’s Pageant, which dates to just a few years later: “ij grett wodyn, [armed] with ij grett clubes all in grene, and with skwybes borning, with gret berds and syd here, and ij targets….” In other words, they are two wild men with clubs, squibs, beards, side whiskers, and small shields. Although the Crowcombe figures do not have burning squibs, they are otherwise rather exact representations of the Lord Mayor’s wodyn, which may already have been called Green Men, and which were certainly so called within a few years. The fact that they emerge directly from the foliate head in this carving, at almost the same time that the name “Green Man” begins to be applied to them, is very suggestive, and to Centerwall is the clinching evidence that the foliate head and Green Man are one and the same. We may be more cautious with Centerwall’s evidence, and note only that people in the sixteenth century, fifteenth century, and possibly the thirteenth century, clearly associated the Green Man with the foliate head. The fourth example of a direct association between the foliate head of church architecture and the wild man or Green Man occurs in a misericorde originally from Whalley Abbey, which is now in St. Mary’s Church, Whalley, Lancashire. 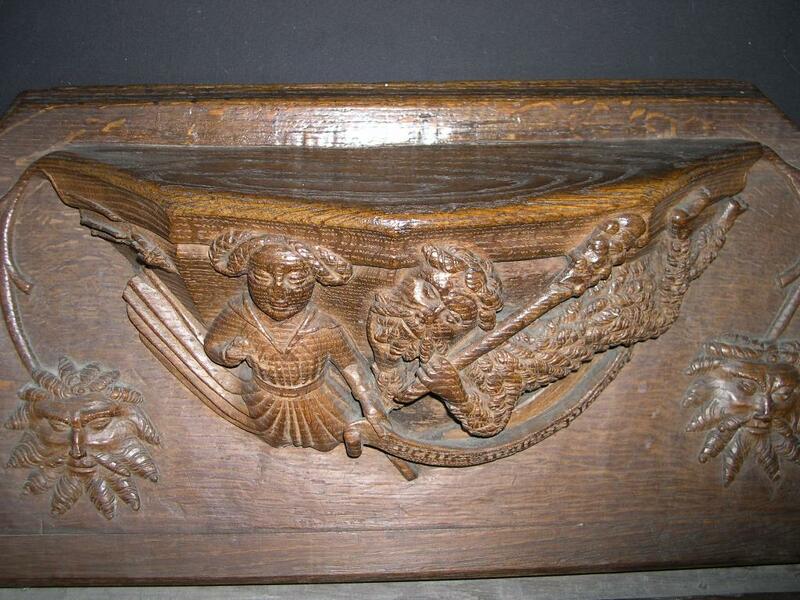 It was carved between 1418 and 1434, and shows a club-bearing wild man hovering over a lady’s shoulder. From the corners of the scene grow two vines, which terminate in foliate heads. The points on the leaves of the foliate heads are carved to closely resemble the spikes of the wild man’s beard and hair. The carving bears a motto in the form of a proverb: “Penses molt et p[ar]les pou (think much and speak little),” although there is seemingly little connection between this proverb and the scene illustrated in the carving. The fifth example of an association between the foliate head and the wild man/green man comes from the title page of the only known original edition of The Cobler’s Prophesie (1594), which contains the second known occurrence of the term “Green Man” in English. The page is marked by two interesting decorations. At the top of the page is a pair of wild men, facing away from one another and surrounded by leaves and flowers. From the mouth of each wild man issues a vine, which grows to bear a puffy leaf. From the hairy legs of each wild man grows another vine, which curls around and bears leaves and flowers. These figures are wild men that disgorge vines and sprout leaves and flowers—in other words, a creature halfway between the wild man and the foliate head. In the center of the page is a figure clearly derived from the disgorging foliate head, but which seems to sprout not only leaves, but also architectural elements. Taken together, the two images combine the wild man, the foliate head, and architecture, in a sixteenth-century book that also refers to the Green Man by name. Once again, this is very suggestive of a conscious link between the figure then known as “Green Man” and the foliate head in architecture. As with any body of evidence that covers a wide sweep of history and geography, these occasions on which the Green Man/wild man was pictured alongside the foliate head may be dismissed as individual associations of the two characters with no historical connection to one another. Centerwall takes the opposite tack, and concludes that the Green Man/wild man and the foliate head were considered to be one and the same figure. I think both positions are rather extreme given the evidence. As I commented in part 2, Lady Raglan’s equation of the Green Man with the foliate head was “a reasonable analogy between similar figures from traditional art.” The similarity in question was a combination of greenness or leafiness with humanity, a combination which imbues both the Green Man and the foliate head with a similar range of traditional meanings. This would naturally tend to make people associate the two figures, as each of the artists in question did in the Middle Ages and Renaissance, and as Raglan did in modern times. One of those traditional meanings seems to have been that humanity, like vegetation, must follow and adapt to the changing seasons. It gave rise to a connection between the Green Man and calendar customs, which will be explored in the next part. The references are in the text above in the form of links to the relevant books and articles in their online homes.